unheated -the whole place neglected. and all the dark places light. 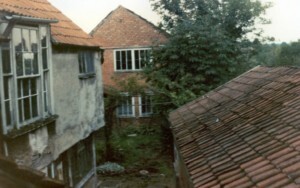 The properties at 28 and 28A Castle Street in Thornbury were long associated with the Mills family. We have already described the details of the buildings of 28 and 28A but the photograph below shows rear views of the property with the outhouses mentioned in Diana’s poem. “was a trustee in the interwar period when there was great pressure that the Thornbury Methodist Church should be closed. He refused as a trustee to sign the closure paper work. He lived into the 1970s and with the expansion of Thornbury from 3000 to over 10000 saw his chapel filling up again and the great joy that his act of faith in refusing to agree to closure had been justified. I do not know how many of the other trustees of the 1925 list had agreed with him“. The 1881 Census implies that Robert was the son of George Mills a 54 year old mason and his wife Sarah aged 60 (Sarah seems to have been called Martha in the 1871 Census). Robert was only aged three at that time. However the parish records make it clear that Robert and his older brother James were actually the sons of George Mills’ unmarried daughter Georgina who had been working as a domestic servant. Robert was born on 30th January 1878 in St Mary St Thornbury and baptised at St Mary’s church on 24th October 1878. We are grateful to Robert’s grandson for an explanation of this. He has told us that Robert’s mother went to Wotton under Edge when she married. Robert remained with his grandparents. Robert’s marriage certificate shows that his father was “Samuel Mills deceased”. The 1891 Census shows him living in what became 5 Horse Shoe Lane with his widowed grandmother Martha Mills a laundress aged 69. It seems that Sarah was probably more often known as Martha. We have been told that Robert used to help to deliver the laundry on a little truck or trolley. Martha Mills died 23rd June 1900. Robert enlisted as a soldier in the Boer War on 18th April 1900 and served in the Gloucestershire Regiment. The family has his campaign medal. His family also believe that Robert spent some time in Australia but at the time he enlisted he was living at Barton Hill in Bristol. We do not know where Robert Mills was living in the 1901 Census but he may have been living in St Phillips in Bristol with Thomas and Mary Nation. However in this case Robert was described as George Robert and was said to be a nephew of the Nations. On 17th December 1903 Robert Mills married Phyllis Liddiatt in Bristol. At that time they were both living at Albert Place in Bristol. Phyllis had been a house servant in Westbury on Trym in Bristol. The 1881 Census shows her in the house of her grandfather, Daniel Liddiatt a labourer then aged 58. They were living at 45 St Mary Street. Her parents were William and Ellen Liddiatt. William Liddiatt was a coachman to William Grove Salmon, although on Phyllis’s marriage certificate William’s occupation is given as “gardener”. We believe that the photograph on the left was taken at the wedding of Robert and Phyllis. We have been told that Robert is the man in the centre of the photograph and so we assume that Phyllis is the young lady on the right. We have been told that it is possible the young man on the left is Billy Liddiatt. If that is the case he would Phyllis’s younger brother. It seems likely that Robert and Phyllis came to live in Thornbury after their marriage because when their son Arthur Robert began at the Council School his date of birth was given as 7th July 1905 and this was registered in Thornbury. We do not know exactly where. The 1907 Voters List gives Gillingstool as their address. The 1910 Rate Book indicates that they moved to 12 Pullins Green . The 1911 Census shows Robert was a painter (house decorator) aged 33 and he was living there with his wife, Phyllis, aged 33 and sons, Arthur aged 5 and Ivor aged 1. Robert’s address in the 1912 Trade Directory was “John Street” which at that time would be still be Pullins Green. The 1913 Voters’ List also says Pullins Green. We understand from Robert’s grandson that Robert worked for Edwin Salmon who was living and working at 28 and 28A Castle Street and that by the time Edwin died in 1914 Robert was his foreman. Mrs Salmon continued to run the business after her husband’s death but Robert felt that the work and responsibility were his. He said he would leave the business if he could not buy it. Mrs Salmon agreed and with the help of Mr Phillips Robert bought the business. From as early as 1918 Robert Mills was in the Trade Directories in Castle Street and the company later traded from this property in Castle Street as Mills and Phillips. We believe that the “Phillips” in this would be the son of William Alfred Phillips of Upper Bath Road. This family were also Methodists and William Henry Phillips became a painter and decorator. The records of Thornbury Grammar School show that the family’s address was Castle Street when the elder son, Arthur Robert was admitted to the school on 18th September 1916. Arthur Robert was very successful at school and gained his Cambridge Junior exam in 1919 and his Cambridge Senior in 1921, in which he gained a distinction in Botany. He passed his Higher School Certificate in English and History and left school in July 1923 to attend Bristol University. Robert and Phyllis’s second son Ivor was born 24th July 1909, also in Thornbury. In 1917 Robert was given a conditional exemption from the First World War, although we have not seen the reason for the exemption. At that time the record shows that he was living in Castle Street and aged 35. We have photographs showing Robert was a member of the Home Guard’ known as 1st Volunteer Battalion of the Gloucestershire Regiment. The 1918 Trade Directory shows that Robert was trading in Castle Street. By 1923 the business was trading as Mills and Phillips. We have a photograph above of a coach outing for the members of the Methodist Church in 1927. It shows Robert Mills with a moustache, standing at the back. His son Ivor is standing next to him and Arthur is sitting next to them, with his arm leaning on the side. Phyllis Mills died on 28th August 1951 aged 73. Robert Mills appears to have remained as interested as ever in the Church. We know that Robert was reappointed Trustee of the Methodist Church in 1968 when retired and living at 28 Castle Street. In this context “28 Castle Street” could be either 28 or 28A. Robert died November 8th 1972 aged 94. Arthur Robert Mills was born 7th July 1905. He was admitted to Thornbury Grammar School from the Council School in 1916. He did well at the Grammar School and gained distinction in the Cambridge Higher exam. He gained a place at Bristol University where he read Arts. Ivor Mills was born on 24th July 1909. We are grateful to Ivor’s son for more information about him. We understand that he was a very quiet, reserved person and that he was the organist at Thornbury Methodist Church and the chapel at Rudgeway. Having gained the Cambridge School certificate in 1925 he left school and, in accordance with his father’s wishes, he joined the family business. The 1935 Electoral Roll shows that Ivor was still living in 28 Castle Street living with Robert and Phyllis in Castle Street. By this time he was working in the business too. In 1936 Ivor married Gwendoline Timbrell in Thornbury. Gwendoline’s birth had been registered in Thornbury in 1916. She was born in Berkeley Road. She too was brought up by her grandparents after her mother married and moved to North Wales. The register compiled in 1939 in the advent of war shows that Ivor and Gwendoline lived at what later became known as 36 Castle Street. Gwendoline’s mother Eliza Timbrell was living in the house with them. We do not know when the couple moved into Ivor’s old home of 28 Castle Street but in 1954 which is the first electoral register to show the house numbering Ivor and Gwendoline clearly live at 28 Castle Street with Robert. When World War II broke out Ivor was too old to be called up and so became a volunteer foreman in Thornbury. During World War II his wife Gwendoline worked in the Council Offices, issuing ration books. Later she also served on the League of Friends at Thornbury Hospital. The names of Ivor and Gwendoline Mills continued to appear in Electoral Rolls at this address until the 1980s. Gwendoline Mills died 29th July 1983 and Ivor on 10th February 1984. We have been told by many people that Ivor was much liked and respected in Thornbury and we would very much like to know more about him. Diana Hendry who then lived at Epworth House a few doors further up the street wrote the poem we have quoted above to honour this unassuming man who had such integrity. We know that he was also regarded as a very accomplished tradesman. Several people who saw the business operating were very impressed by the the production of wallpaper which was printed and cut to order by a fascinating machine in the tall building at the back of the house. This service seems to have been unique in Thornbury.